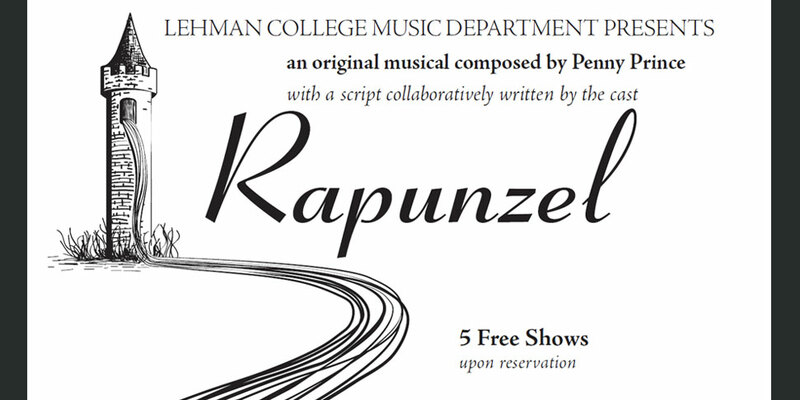 The Collaborative Musical Theatre Project at Lehman College will present Rapunzel, an original play by Music Prof. Penny Prince on May 11, 12, and 13. An earlier version of the play was presented at Lehman six years ago, but by popular demand, the story will be retold with many new songs and plot twists. This new production of Rapunzel will take a fresh look at the classic German fairy tale by the Brothers Grimm. Performances will be held on Thursday, May 11, at 11 a.m. and 7 p.m., and on Friday, May 12, at 11 a.m. in Room 306 of the Music Building. On Saturday, May 13, performances will be held at the Bronx Library Center at 11 a.m. and 2:30 p.m. The show is free and open to the public. Prof. Prince is well known for her work in collaborative musical theatre productions and believes this method gives cast members a sense of empowerment and added responsibility. This is her sixth musical production for the College. Previous productions include Sleeping Beauty, Rumpelstiltskin, Cinderella, and When I Get to Where I Am Going.